Everyone has that one make up item that if you were deserted in a desert island it would be the one they would take, and for me that's eyeliner!! An not just any eyeliner, for me it has to be the Illamasqua Eyeliner Cake. For me it is the number 1 eyeliner that I've ever come across. You get so much product for the bargain price of £15.50, as it will last forever. 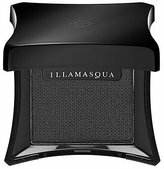 (even cheaper at £9.30 if you have a professional account with illamasqua) Unlike liquid and cream liners, it doesn't dry out as you use a liquid to activate it, i use the Mac Fix + or you can use the Illamasqua sealing gel. Ive already had the mac fix + and i find it works perfectly and you only need a tiny drop so again it last for ages. as mine is over loved and a little scruffy looking! I find it so easy to apply and work with as you can get a thin or thick line with it and when it dries it is a Strong Matt black which I love. The finished result always looks smooth and is easy to smoke out into shadow if you are wanting a more smokey look. Basically for me there is nothing this product doesn't do! I love it!!! Mac fix plus and Illamsqua's sealing gel! Perfect mixing mediums for the eyeliner cake! I use this everyday either on myself or on clients and anyone I have introduced this product too, they have loved it just as much as I do! Perfect for first time eyeliner triers and for any eyeliner obsessive! If you could only have one item of make up to take to a desert island which item would you choose?? ?